The group, in a statement by its publicity secretary, said Mark’s speech espoused good judgement to an extent, marking a major detour from the one he delivered at the Nigerian Bar Association’s Conference a few weeks ago. 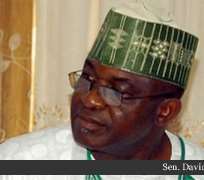 Mark, at the NBA annual conference in Calabar had said Sovereign National Conference is not workable under the 1999 Constitution. But in his speech on Tuesday, Mark not only agreed that SNC is possible under the 1999 Constitution, he saw it as a way for Nigeria to stop playing the ostrich and to “confront structural distortions”. The group however flayed Mark’s proposed national conference, describing it as a piecemeal and democratic robbery. The statement said: “We condemn Mark’s morbid obsession for the false inviolability of 1999 Constitution, a recurring theme in his speech. We wish to restate, for the umpteenth time, that Nigerians are not made for the law and as such, their fate cannot be sealed, as Mark wants, by the Constitution. His job will be more fruitful if he directs the affairs of his office by the conviction that NASS represents the people and not the constitution. “We also found it distasteful for Mark to condescendingly regard leaders of ethnic nationalities as 'an unpredictable mass,' a description that shows he still bears vestiges of military dictatorship, even after more than a decade as the custodian of the nation’s democratic institution. The group also restated its belief that “the lot of this country will not change for good until we find the courage to summon all ethnic nations to the table of brotherhood to fashion out a new constitution as the current effort at constitutional review is a futile exercise that can never foster our nationhood.